This 4-5/8" stroke 8-1/2" diameter flywheel assembly fits 1999-'06 HD® big twin engines (except Dyna models) and S&S® T124 engines. May be used to replace the flywheel assembly in an S&S® 124" Hot Set Up Kit®. Sprocket shaft does not have a stock style bearing race pressed on. This flywheel assembly is for crankcases with Timken® sprocket shaft bearing. Flywheel assembly is three piece design. Pinion and sprocket shafts are forged as part of the flywheel. The only joints in the assembly are where the 1.671" diameter connecting rod crankpin is pressed into the flywheels. Flywheels are CNC machined from heat-treated, closed die, steel forgings, which are 114% stronger than late style stock steel flywheels. Fully assembled with premium quaility S&S® heavy duty 7.667" connecting rods, with full width wrist pin ends, and dynamically balanced. 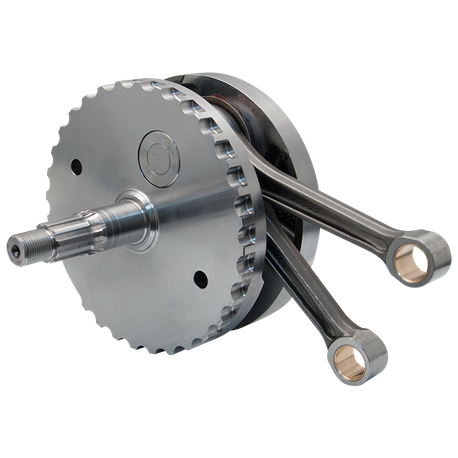 Assembly is trued to less than .0005" runout on pinion and sprocket shaft bearing surfaces, making them capable of higher rpm and fully compatible with gear drive cams.